THE United Party for National Development should cleanse itself of tribalism before it can rise from the ashes of its monumental loss to the Patriotic Front (PF) in the August general elections, Kennedy Kamba has said. proprietor Richard Sakala have ganged up against the leadership of the opposition party. Mr Kamba said the UPND would never rise from its political ashes to form government in Zambia because the opposition political party had failed to cleanse itself from accusations of practising regional politics. “The rise of the UPND from its setbacks will depend on how the opposition party is going to rise above tribal politics. The UPND had a chance to demystify their tribal tag in Parliament on the positions of leader of the House and Chief Whip but proved that they could not after choosing two of its MPs from the same region for the two positions. Mr Mwamba should know that the UPND is just using him to cleanse itself from the tribal tag because the party is determined to take over government at all costs,” Mr Kamba said. 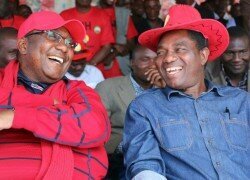 He said if the UPND were thinking of rising from their setbacks from the last general elections, the opposition party should work hard and find a different presidential candidate other than Hakainde Hichilema who he said had ascended to the top of UPND because of his tribe. He said the UPND would continue to find it difficult to penetrate other regions in the country if the party was going to maintain Mr Hichilema as its presidential candidate in future elections. Mr Kamba said the PF was an all-inclusive political organisation and that was why the party chose Edgar Lungu as its candidate following the death of President Michael Sata. He recalled that after the death of Mr Sata, many of the ruling party senior party officials who had money expressed interest in succeeding late Sata but the general membership overwhelmingly chose Lungu who had no money. Furthermore, Mr Kamba said claims by Mr Mwamba that the opposition party would one day form government was nothing but utopia and fantasy which would never come to pass.